Bleeder cleaners prevent vapor releases, fires, and explosions while clearing clogged bleeder valves, instrument taps, and analyzer points.They also protect users from exposure to hazardous materials. As such, choosing the best rod out tools is instrumental in keeping your workers safe while enabling them to perform their tasks at peak level. There are three varied application styles. The Angle 60- allows the user to ergonomically stand at a safer position for low point bleeder valves. Straight design- for easily accessed valves such as instrument valves, orifice taps, and analyzer points. No matter what is causing your plugging problem there is an appropriate tool for the job. With the FlowBoss line of bleeder cleaners, you are well equipped to handle everything from catalysts, resins, petroleum residue, coke, ethylene, to other hardened process materials. All FlowBoss rod out tools are designed to be maintained out in the field with field replacement ready made parts kits. This means no more need for factory repairs. Type 1- carbon graphite for services up to 600 psi and 700 degrees F.
Type 2- TFE for corrosive services up to 600 psi and 350 degrees F.
Type 3- pure graphite for any kind of service up to 1,000 psi and 1,000 degrees F.
Custom specifications up to 3,000 psi and 1,800 degrees F are also available upon request. 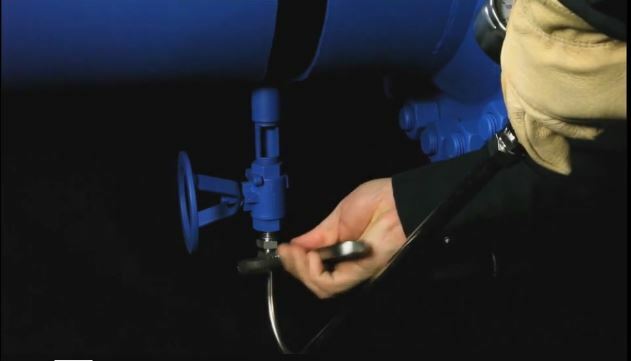 Liquid field pressure gauges prevent damage from full-spanned pressure spikes. One piece ball valves prevent sudden unscrewing and spraying the user with process materials. CokerBoss tools also feature indestructible drills. Worker safety and productivity are two of your #1 daily concerns. Productivity directly affects your bottom line and worker safety impacts productivity. The safer your workers feel, the better and faster they’ll be able to complete their tasks. The tools you provide are a key component of both productivity and safety. Consider making SMP’s FlowBoss Rod Out Tools your choice for all bleeder cleaner applications. Contact Us to learn more about quality rod out tools and other better, safer industrial tools.